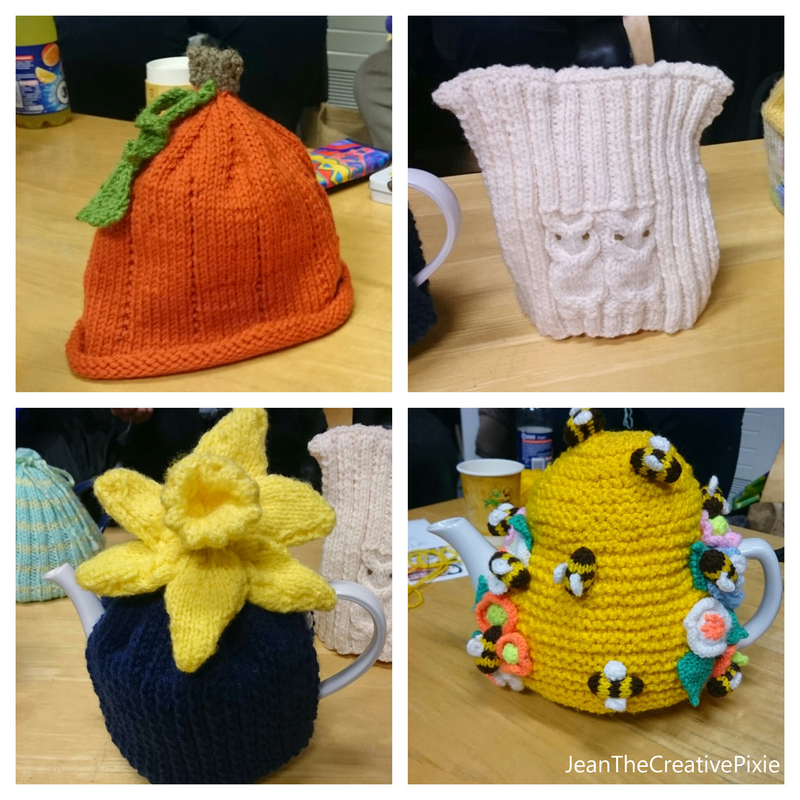 I decided to crochet a tea cosy and after a bit of browsing online I bought a book of patterns – Tea Cozies 3 from Amazon. 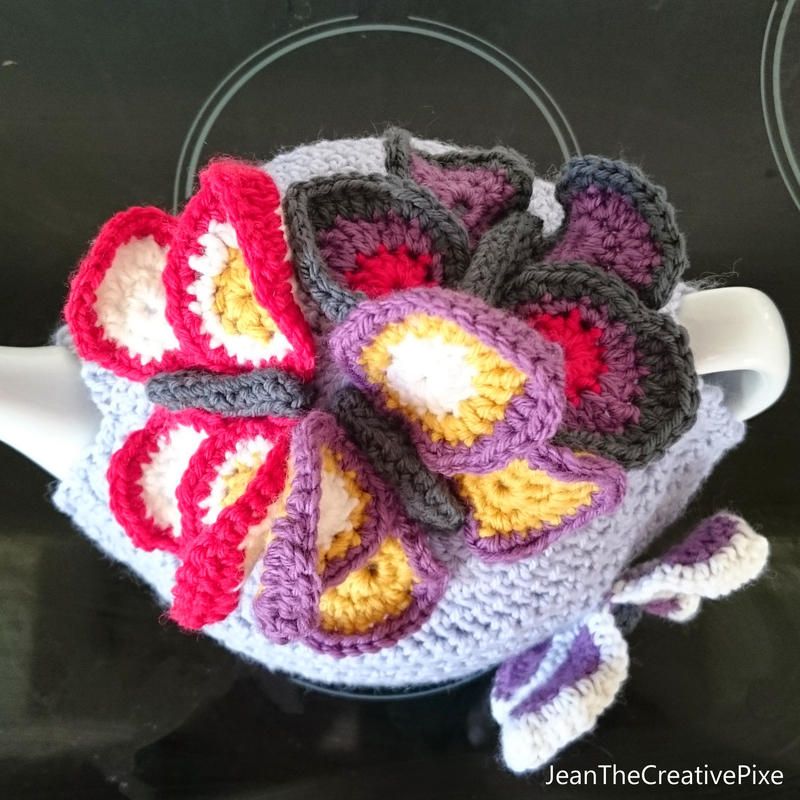 I wanted to do something a bit different so I started to make a butterfly tea cosy using Rowan Pure Merino wool bought specially for it. 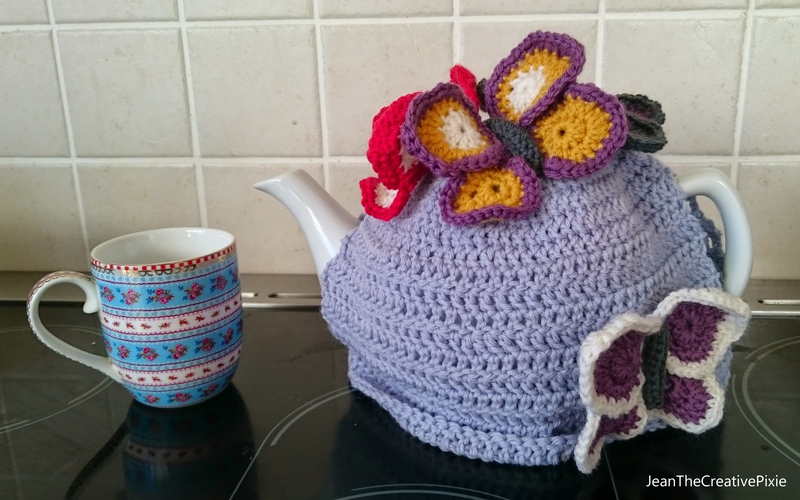 I didn’t follow the butterfly tea cosy pattern to the letter, this is my interpretation of it. I made 4 butterflies in total, 3 for the top and 1 for the side. 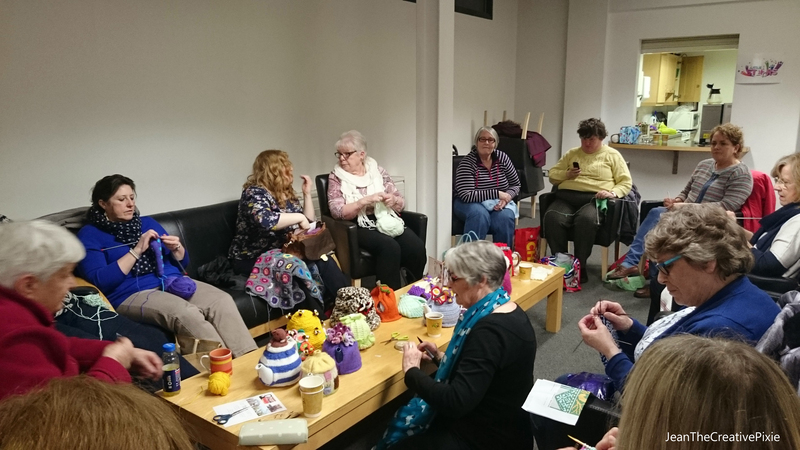 So a couple of weeks ago (mid March) was the deadline for the groups tea cosies to be handed over to the exhibition organisers. 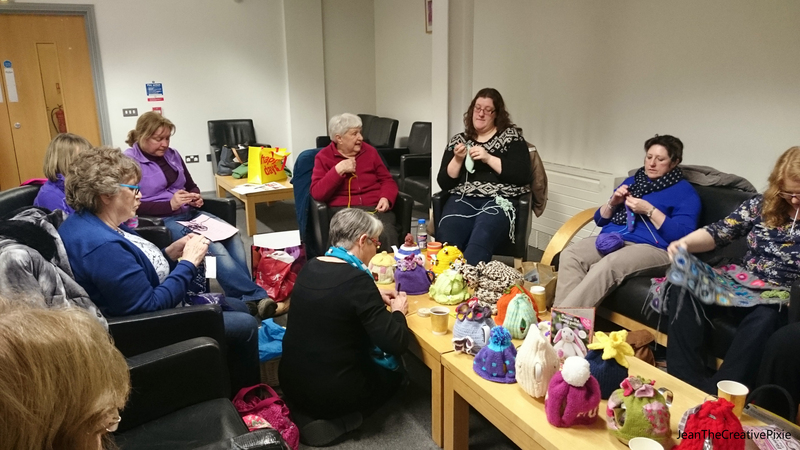 That was a fun night, lots of frantic sewing in of loose ends from some people and photographing of the individual cosies. 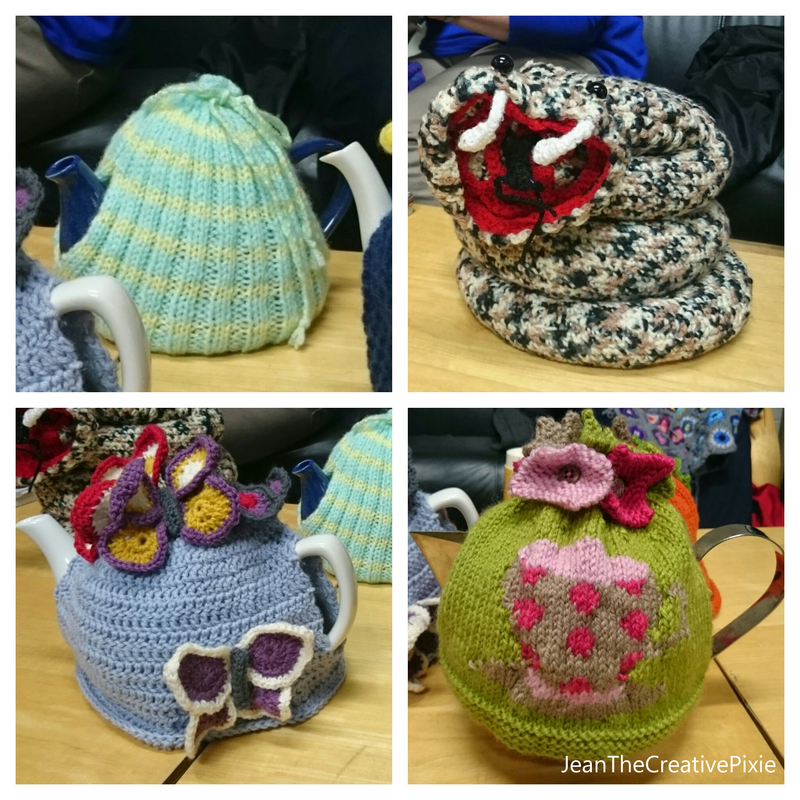 So here are the groups tea cosies. There was only 2 that were crocheted, mine and the snake one. Sooooo fast forward to last Friday, the 20th which was the opening night of the exhibition. I organised for my sister to babysit so me and Mr Pixie got dressed up for a night out. It was so busy at the museum, loads of people had turned up to show their support. 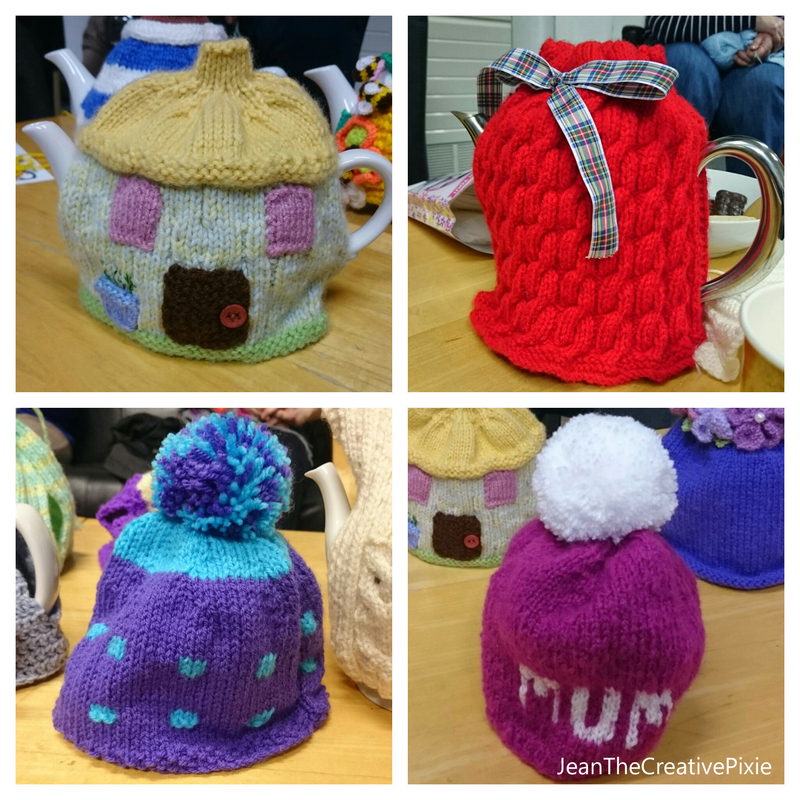 Here are some of the knitters tea cosies at the exhibition. My cosy! If you look really closely there’s a red dot on the shelf – 5 minutes into a 5 week exhibition and it had been sold! 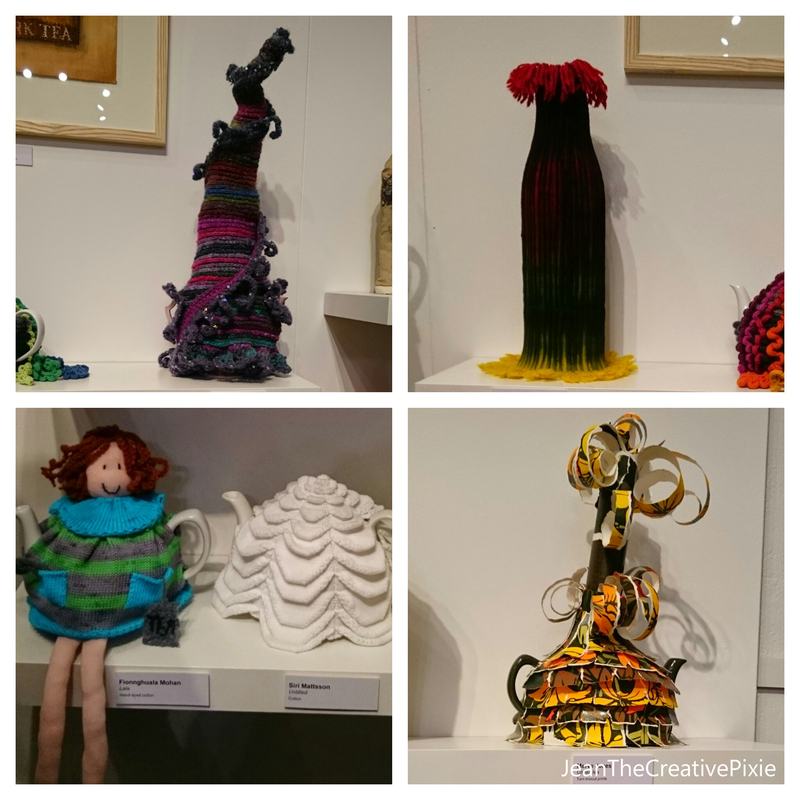 There were certainly some wild looking cosies that the artists had created. Here is a selection of some of them. The top left is made from real dead bees 😦 The bottom right one is made up of seeds. 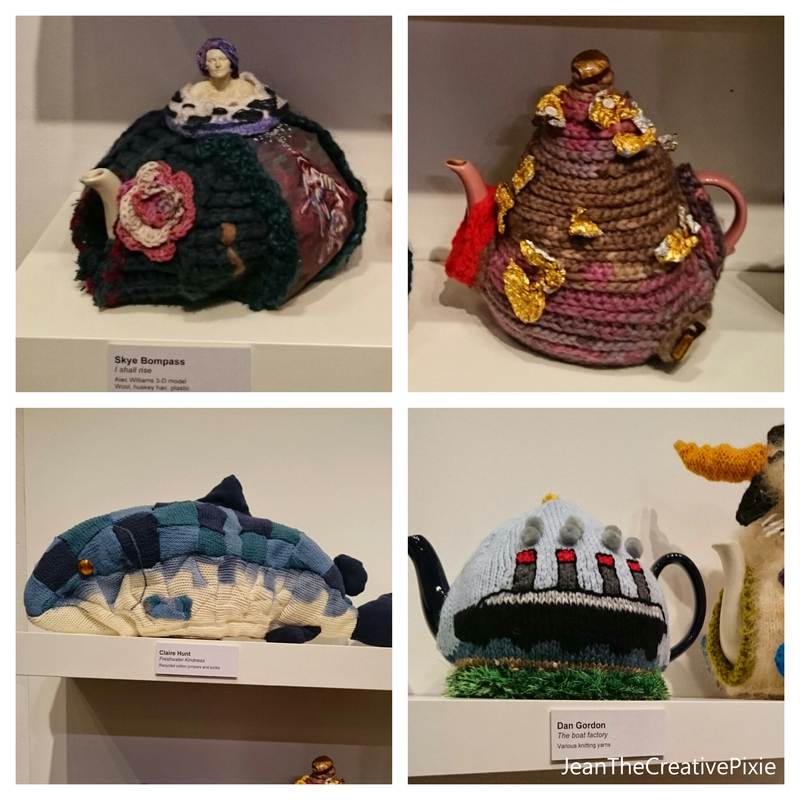 There are plenty more tea cosies that I didn’t get a chance to photograph. If you’re in the Belfast area and you have some free time then please visit the Ulster Museum and have a look around the exhibition yourself. 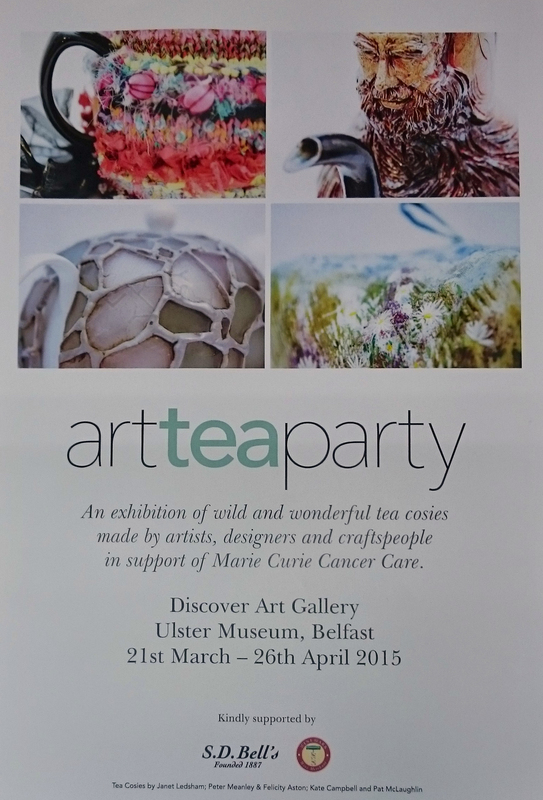 I’m planning on going back again soon and taking Miss P and Miss E with me so they can see the other tea cosies. I’ve heard of a coupe of other charity projects I might make something for, does anyone else have any charity makes in the pipeline? Always makes you feel good when you stuff sells at shows. I love the creativity shown. I don’t sell my makes so this is a first. Congrats on the show and the sale! What a gorgeous exhibit. Congratulations! I am so excited for you and LOVE the pictures you’ve shared! I am in U.S. so won’t be able to see it, so I truly appreciate the article and the pictures. I may see if I can’t get something like this started in Kentucky, the state where I live. Again, congratulations! This is wonderful! Oh well done Jean! 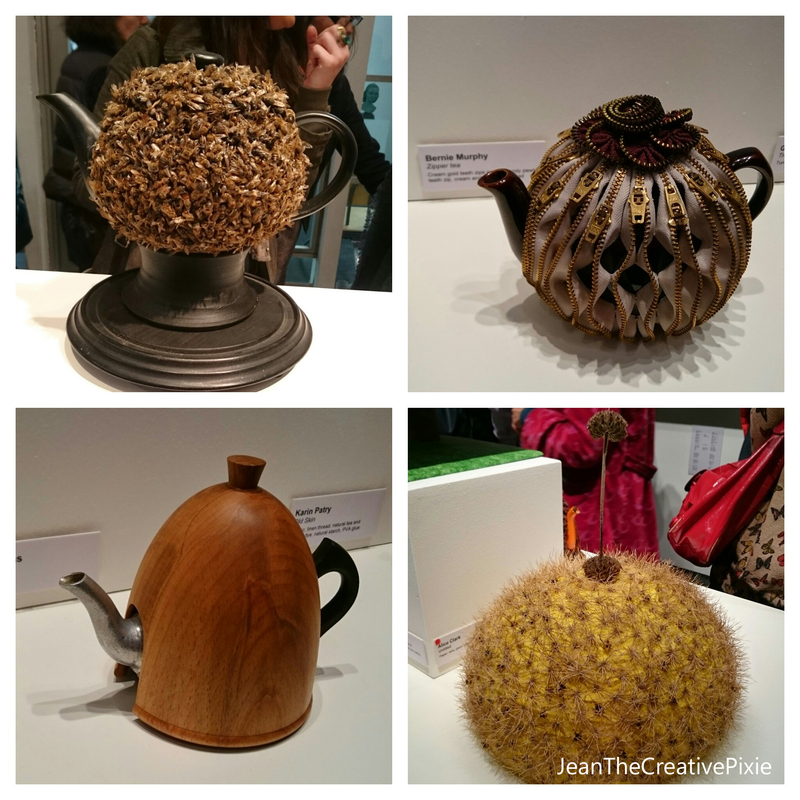 So much creativity shown, though like you I am not convinced by the bees! I want to go back and have a proper look at all of them as there were some I didn’t get near as it was so busy. It’s nice to see such successful fundraising though, and so many people supporting it. If I were closer I would go! Great cause and what a fabulous display they all make – but dead bees??! I can’t refuse any plea for help from charities, so I’m always doing something for one good cause or other. Well done on such a quick sale! 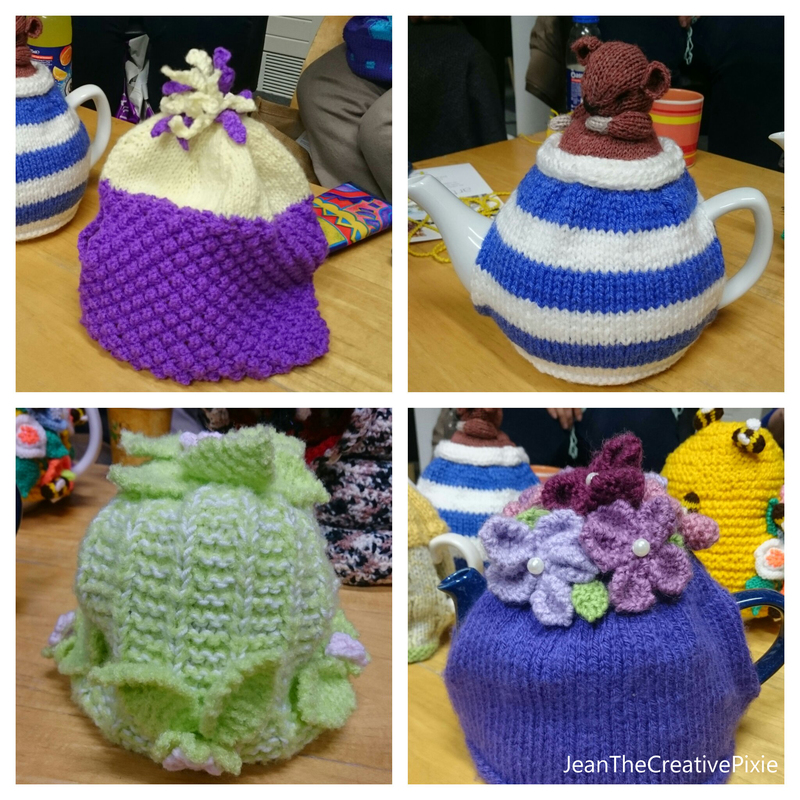 I can’t believe you used such gorgeous yarn for a tea cosy!! Would you believe that the bee hive was knitted by a lady over 80 years old. 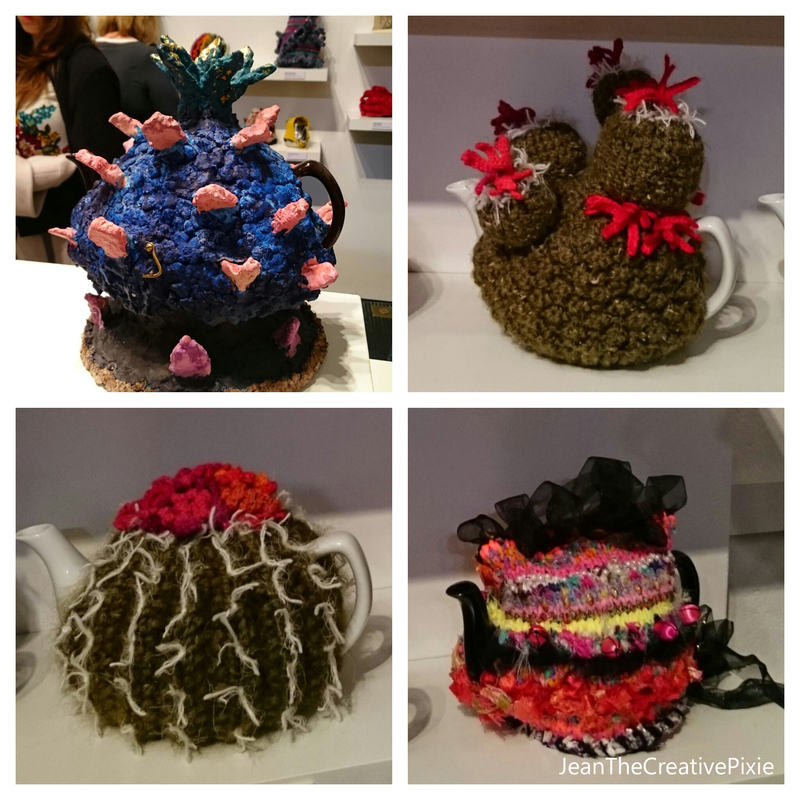 Love all the tea cozies. Your is beautiful! Congratulations on the sell. That is fabulous! Thank you. 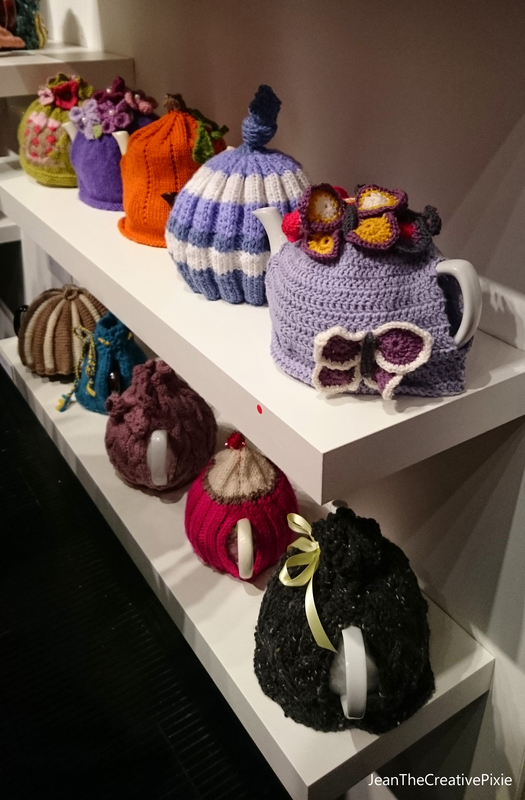 It’s amazing how every tea cosy was different, not one duplicate in style. 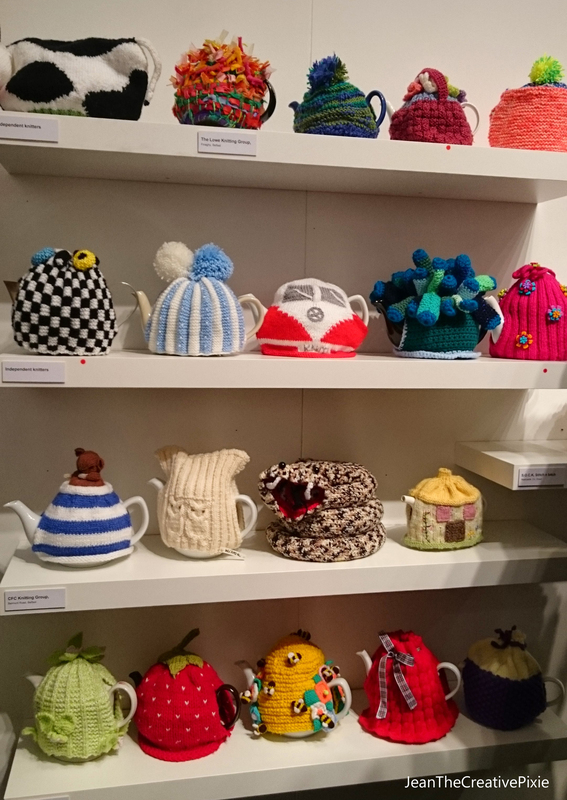 Loved reading your blog and delighted to see my Liquorice Allsorts tea cosy on the shelf too. I didn’t make the opening night but will definitely visit the exhibition. Ah brilliant Marian, I saw your cosy, I see it got a red dot too! 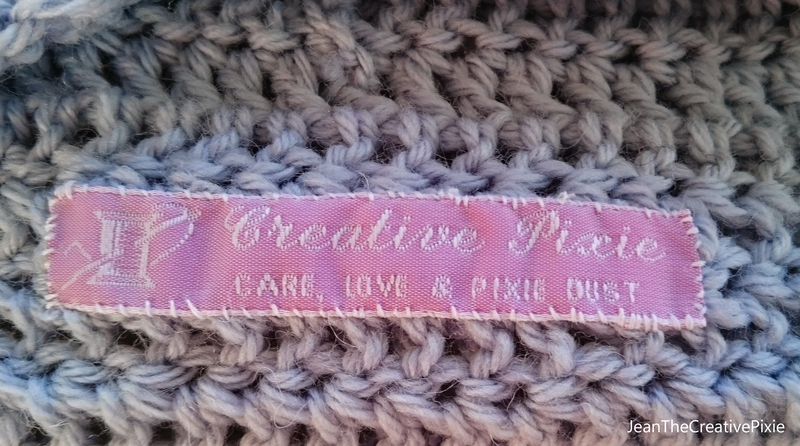 Tea cosy heaven, it’s amazing how many different versions of this useful item can be created, some gorgeous creations. Well done for your sale.